Affiliate marketing in one way or the other has come out to be one of the best ways to earn big from blogging. Many bloggers have accepted the fact that affiliate programs like Jumia affiliates have help them full their accounts without having any payment issue or them being defrauded in any setup. Jumia is one of the biggest online store in Nigeria and Africa at large. Nearly everybody in the country literally wants to buy an item from Jumia. Even my mum bought her phone from Jumia Nigeria. Just so you know how the Jumia platform is. The Jumia online shop works well in most west African countries and their deliveries have always been superb. Do I Have to Paste Banners Before I Can Earn? Sign Up For Jumia Today! Properly Add Affiliate Banners to Blog. Top Recommendation To Earn More! Jumia’s big market structure is the exact reason while you should consider signing up for Jumia and just so you know, Jumia has recently made the sign up very easy. In less than 10 minutes you will have your Jumia ads up and be running. This is the reason why I opted in for Jumia affiliates. 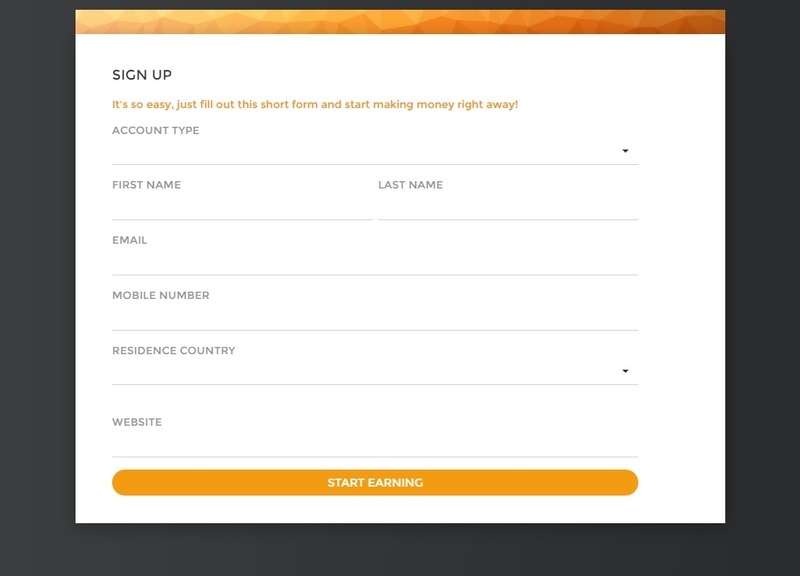 It’s by far the easiest sign-up process I have ever seen. It doesn’t require you having a website to sign up because they have now included links, banners and images which you can easily integrate with any platform. You can even make money via Facebook using Jumia affiliates. Just like I early said, Jumia is very easy to sign up to and get approved instantly. I have tried signing up with a lot of methods and they all worked out. Check out the following try an error I did that also worked out. 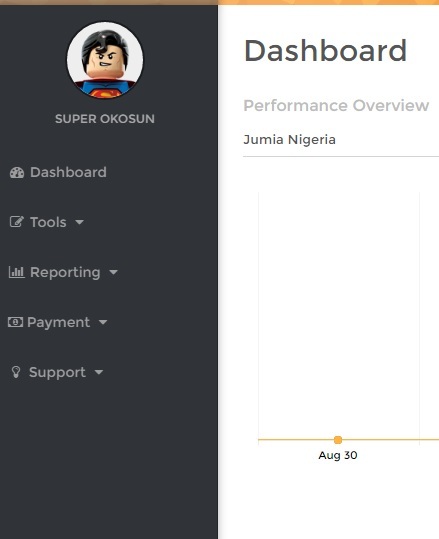 If you try the above procedures for another affiliate like google Adsense, Infolinks, Adoptimal, it definitely won’t work so you see how getting approved by jumia affiliates is easy and fast. Jumia being an online shop, it’s affiliate partnership with your blog enables you to earn a certain amount (5-13% commission) of every sale made via your blog. Assuming a commodity is worth N100,000 and a visitor of your blog purchase it via the link on your blog or banner then you as a blog owner will earn N11,000 from that sale. Now you see it’s a big deal that will earn you huge income. Not every niche blog can earn such an amount from Jumia because not every blog is related to selling product review. 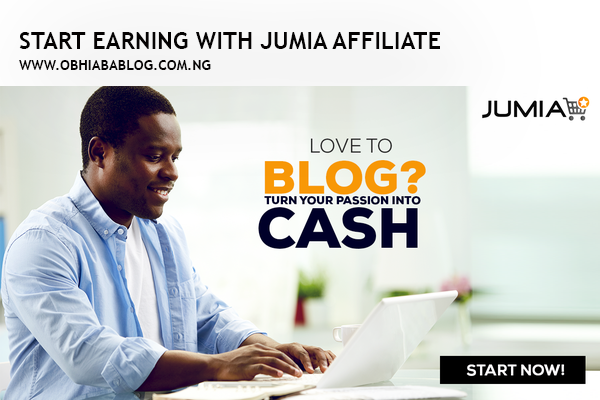 The most paying blogs for Jumia affiliate are the product review bloggers. If your blog is based on technology and you offer posts on phones, laptops, tablets reviews, price and specification then Jumia is ideal for you. I have seen product review bloggers like Shelaf that have completely forgotten about Adsense because of the mouth watering amount they make from Jumia. Other bloggers that deals on markup kits, dressing (fashion), luxury, lifestyle can also make hug money from Jumia. Jumia affiliate have no issue with your blog ads. All it does is come to your website pick the spot you placed it and start earning for you. I once used Jumia and Adsense together (Ijokos Blog) before I was hacked but ever since then, I have not tried it but I have seen a number of persons doing it and earning well. If you feel there is no space on your blog, to place banners, it is fine because Jumia doesn’t only offer you banners but they also offer you links and images which you can paste into any post you write. Note: Irrelevant pasting of affiliate links will affect your blog rank on google search, so do it wisely. In a situation where you write about the review, specification and price of a recent phone like the Infinix Hot 3, you can simply add a link like this (buy for N28,900 on Jumia) anybody that wants to buy, will simply clink and buy, which will earn money for you. Do you feel convinced to give it a try? then follow the below procedures and get your Jumia affiliate program running in less than 10 minutes. Get your email written down, also write down a password you would want to you. If you don’t know your blog URL, then simply visit your blog and copy it into a notepad. Take a look at your blog and find the best places to place your banners and links. After finishing the above things, simply clink on the link below (the link will take you to the signup page). Fill the sign up from. I have screen shot it and added a better sign up details for you. Just check the image below for the easy signup. Open your mailbox and you should see a confirmation link. In the email sent, you will see two links, one to set your password while the other to log on. First, clink on the password setup clink and create your password. Then clink on the login link. Type in your email address (as username) and then type in your newly created password. It’s up and running already. You can now instantly see your affiliate dashboard and can also add banners to your blog immediately. But first, lets up try and understand the main and important section of our dashboard. This section is where you can add banners, links, and app install to your blog. If you want to add a banner, it will look like this. Advertising Offer – Select the country you are in. for me, I selected Jumia Nigeria. Banner Folders – Choose any product on the list you wish to advertise. I will be selecting ‘Home Week’. Banner Size – Select the banner size you wish to place. For sidebars i suggest 336×280, 300×250,300×600 For footer and columns, i recommend 728×70. For mobile i recommended 320×100, 320×50. If you wish to show it as a gadget in Blogger or WordPress, then copy Banner code and save it in a notepad. Same procedure applies to link builder and Apps Install. This section tells you how well your affiliate is working. The number of clinks, impression and commissions. For easier usage, it is grouped as follows. Daily Summary – A complete details of everything that happened that day. The impressions, commissions, sales and clinks. Conversions: A total report of the conversions or sales you have made thus far. SUBID – I quite don’t understand it fully but you can read this post I met on the wed – Ever Wondered What a ‘SubID’ Is? Payments are the section where you need to fill in your details to get paid. Just as simple as it looks below. Fill the form and save the information. You don’t have to hurry about it as you can do it anytime so take your time and fill the form. Please avoid making errors. 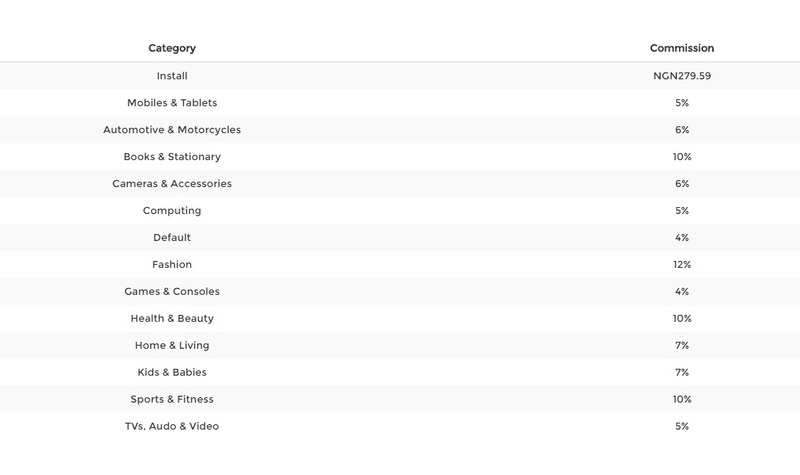 Ever wondered how to find the commission rate for any item you are pasting on your blog? well, this page tells you everything you need to know. You get paid N279.59 for any app install while for every other thing, you get a commission rate. See the full list below or just simply visit the commission models under the support in your dashboard. We have successfully created an account, now it’s time to add the gadgets or banners to our blog. logon to blogger.com >> select blog >> Located “layout”. Clink add a gadget in any location you want to show the banner. Paste the Jumia banner code you earlier copied and clink on save. Clink save arrangement. visit your blog and you will see it displaying. Want to know the most paying spots on your blog and how to place banners there. Follow my previous post here. With Jumia Affiliate you can earn big amount of money but I recommend you use jumia along side other affiliate programs. AdternativeAds – Sign Up Now! AdsOptimal – Sign Up Now! I love them because they work well for me. Alternative ads per me per clink, AdsOptimal pay me per impression while Jumia Affiliate pays me per sale. I wish you luck in making a great amount from your blog and don’t just blog for money, blog for passion. Do you love my tutorials? Wish to support me? simply clink the banner below to earn me USD0.1. Thanks as you do that. Much love. Simply open an account on Mgcash and run their content locking widget. Yes you can... Just follow the procedures above. He is Three much not just too much, his blogging tips are the best i have ever read as they are easy to understand.